Canada and Azerbaijan’s highly power dependent circuits were a major test for the wider, more drag inducing 2017 F1 cars, yet some significant changes to the wings was able to trim drag while maintaining high loads, producing lap times noticeably quicker than last year. In addition, some teams were eager to continue all-round development, such is the development potential with the greater regulatory freedom for 2017. Mercedes introduced some track specific updates to its W08 for Baku, aiming to lower drag for the minimum downforce penalty. Firstly, the uppermost flap on the front wing was reduced in size compared to the version used in Canada. This will have reduced the car’s skin friction drag, with the lower surface area decreasing front load. It is crucial to have a balanced car such that the driver can push with confidence, and as a result, the rear wing’s angle of attack was lowered, decreasing the downforce it produces. Mercedes has already used a medium downforce rear wing for the majority of the season, and the new design was based on this, although the entire AoA was reduced for lower vortex and skin friction drag. In addition, only three louvres were required in the endplate to minimise the pressure differential either side of it, thereby limiting the energy of the drag-inducing wingtip vortices. Ultimately, this new rear wing design was not used, with the team preferring the higher downforce version in order to place the tyres in their correct operating window. 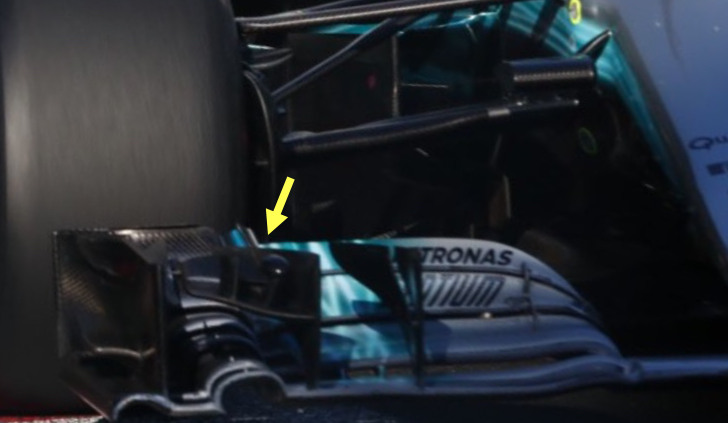 Interestingly, Mercedes has been one of the few teams to run without a monkey seat in Baku, clearly not suffering with airflow attachment around slow corners enough for the benefit of the part to outweigh the drag it induces. Ferrari’s development was muted in Baku, although the camera mounts have been altered, with the most inboard part no longer being solid, but featuring two cut-outs, resulting in two downward sloping stalks. These will create a downwash effect as Ferrari looks to minimize the disturbance of the camera mounts on rearward aerodynamic performance, and perhaps provide the bargeboards with more airflow to dissipate the front tyre wake. For Canada, Red Bull arrived with a significant aerodynamic update, aimed at further closing the gap to Ferrari and Mercedes. The area around the top of the sidepod was modified for the third time this season, with an arched section terminating halfway along the width of the sidepod being removed, in favour of a more detailed set-up, featuring three outwardly shaped fins, as well as a horizontal element extending from the cockpit side. This new set-up is highly resemblant of that on the McLaren, which is not particularly surprising given the two teams run very similar aerodynamic philosophies. Ultimately, the new design was not chosen for competitive sessions, but the purpose of the fins would have been to direct air at the edge of the sidepod outwards, with the help of three vortices they shed, reducing the amount of air colliding with the rear wheel for reduced drag and less ‘tyre squirt’. This was a development aimed at greater rear stability, the major problem for the RB13 this year. The purpose of the horizontal fin is to keep airflow attached to the sidepod in order to lower pressure drag, although this must be weighed up against the greater drag from the presence of the part itself. In addition to this, the floor cut-out used so far this season has been removed in favour of a straight edge, together with a longitudinal slot further inboard. This is far from a new design, having featured on the Toro Rosso first of all, in pre-season testing. Both the old and new designs aim to bleed high pressure air from above the floor to the low pressure region below it, sealing the rear of the floor from turbulent air with the resulting vortex. Red Bull was expecting the Baku weekend to be a difficult one given the track’s high straightline speed dependency, and as a result, the team brought a low downforce rear wing, with a lower angle of attack, than any wing seen on the grid this season. Using this version reduces drag in two ways. Firstly, the pressure differential either side of the mainplane/flap is lower, reducing the strength of the drag-inducing wingtip vortices, as high pressure air spills over from above to below the wing. Secondly, the mainplane and flap now have a smaller profile, which decreases skin friction drag, although this is not particularly significant compared to vortex drag for a car with wings. 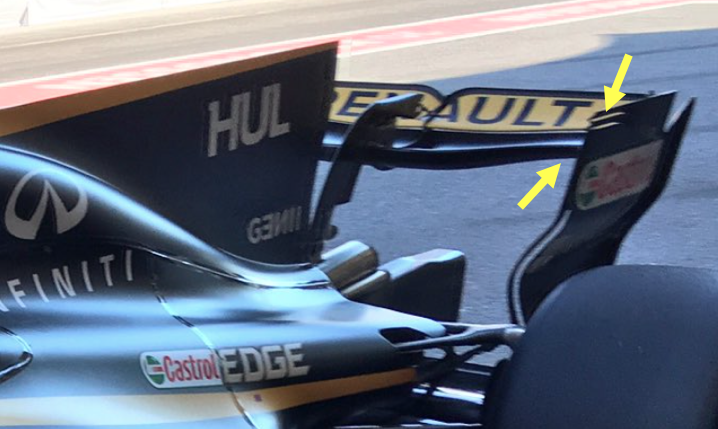 Additionally, the number of endplate louvres was reduced to two, with three or four being used so far this season. 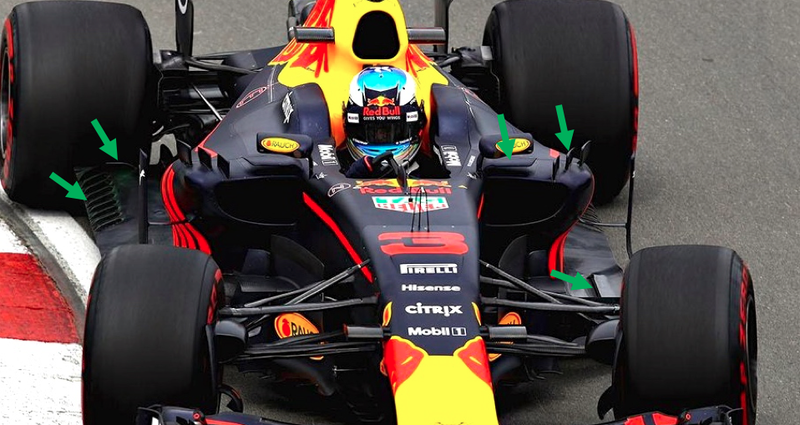 This change has been made as the pressure differential either side of the endplate is lower with the lower angle of attack, so less treatment is required, while such is the reduction in AoA that further louvres could not be spaced ideally. The increased camber of the new wing, at its leading edge, should be noted as well – this level of curvature could not be run with a higher AoA without separation effects being very damaging due to leading-edge stall. It helps to offset some of the downforce reduction while the part’s profile can remain small. For Canada, the bargeboards on the FW40 were revised, with the addition of an extra outwardly shaped element a little outboard of the main part. Adding an extra element will reduce the negative effects of front tyre wake on rearward aerodynamic performance, as the vortex it sheds dissipates the wake and directs it outboard. This seems like a simple change, but this part would have been through tens, if not hundreds, of optimizations in CFD, and then the wind tunnel, to minimize the drag increase for a car based on efficiency. The team enjoyed a stronger weekend in Baku, benefitting from its Mercedes power unit, as well as its high efficiency, low drag aerodynamic philosophy. In addition, the team learned from last year, where too much downforce was trimmed from the car, this year keeping the medium downforce rear wing run throughout the season so far. However, the front wing did require some drag reduction, with the Grove team opting to cut down the chord of the upper two flaps. This would have lowered skin friction drag, as well as vortex drag, the latter due to the reduced overall angle of attack of the wing. It is interesting to note that Williams split its aerodynamic set-ups, with Stroll using the low downforce wing and Massa the higher downforce version. Considering Stroll had struggled in qualifying thus far, this was probably aimed at giving him a better car for overtaking in the race, although this was ultimately not needed. Toro Rosso, being a Renault powered team, had to make significant changes to its car in order to minimise drag around the straightline speed dependent Baku circuit. Having used a reduced chord upper front wing flap at some of the opening races, this flap was removed completely, leaving a four element front wing. 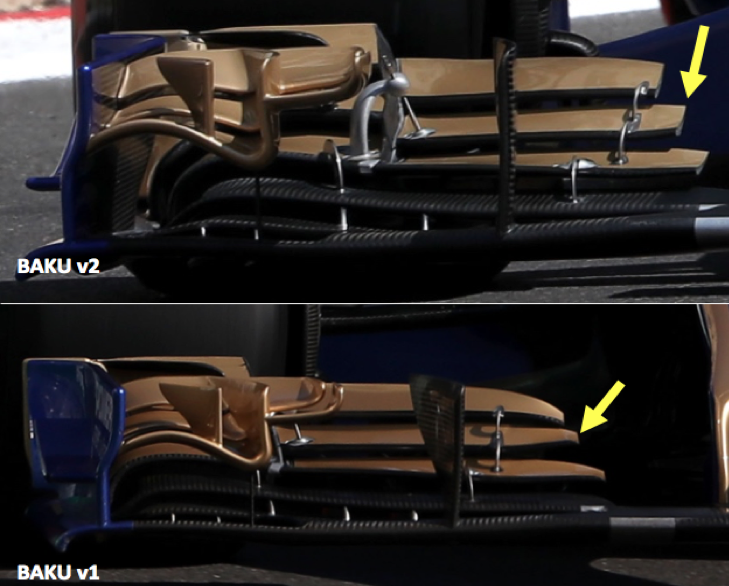 This change resulted in lower skin friction drag, as well as reduced vortex drag, as there is no longer a vortex shed at the inboard part of the upper flap. In addition, the resulting reduced downforce from the elimination of the upper flap will have been able to balance the lower downforce at the rear of the car, where a ‘spoon’-shaped rear wing was used. There have been multiple ‘spoon’ shaped wings run by Toro Rosso this season, but the most extreme version has been introduced this weekend. The new version features an even greater reduction in angle of attack near the endplates than the version introduced in Canada, which lowers vortex drag at the expense of some rear load. Ultimately however, Toro Rosso opted for the rear wing run in Canada FP1 (visible above), preferring a little more downforce for the tight middle sector, where driver confidence is key. Haas introduced significant changes to the rear of its VF-17 for Baku. Firstly, the number of rear wing support pylons was increased from one to two. This is not a structural change, as most other teams use a single pylon despite the greater rear load for 2017. Ferrari is the only other team to use such a design, and although it induces more drag, it perhaps allows precise rear wing flexing under load, reducing its effective angle of attack for lower drag. This would work in tandem with the front wing flaps flexing on the SF70H at high speed, as has been seen multiple times on on-board cameras. Haas is looking for a similar gain here. In addition, the American team is now using a monkey seat configuration, with two elements being added, both highly resemblant of those run on the Ferrari. The purpose of the element immediately behind/above the exhaust is to keep the exhaust plume within a confined cross-section (it tends to rise when unrestricted), such that the rearward monkey seat can expand it and direct it upwards further back. 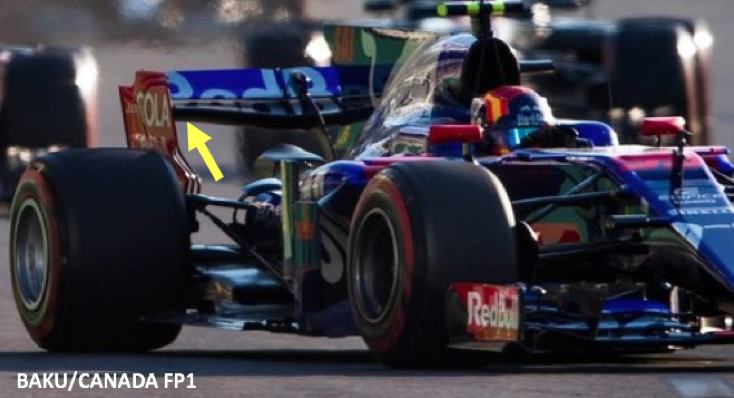 This is in order to improve airflow attachment to the underside of the rear wing, and raise the suction effect of the diffuser for greater downforce. 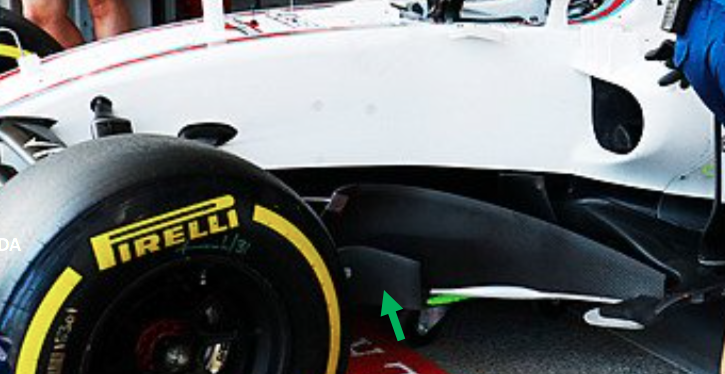 Teams are placing the monkey seat further back than in 2016 due to the slanted nature of the rear wing endplates, meaning the mainplane and flap are situated further back. Lastly, the team has reduced the number of louvres in the endplate from four to three as it looks to optimise how it equalises the pressure differential either side of the endplate for lower vortex drag. Renault endured a tough weekend, involving multiple reliability problems and two driver errors. Nevertheless, the team continued to develop its chassis strongly, and move forward relative to its midfield rivals. A heavily revised rear wing was used by Renault for the majority of the weekend, and selected as the best option for the race. The new design features a ‘spoon’ shape that some other teams have already introduced this season. This version of the wing has a low angle of attack near the endplates, which lowers the pressure differential between the top (high pressure) and bottom (low pressure) surfaces in this region. The area of wing nearest to the endplate is that most critical to the strength of the wingtip vortices, and by reducing the pressure differential here, the energy of these rotating airflows leaving the wing is reduced, lowering drag. At the same time, the angle of attack of the main element is higher, and downforce can be produced here at less of a cost in terms of straightline speed. Moreover, the shape of the flap resembles that of the mainplane and the chord towards the endplates is lower than that along the central portion of the wing, for the same reasons as those outlined above. 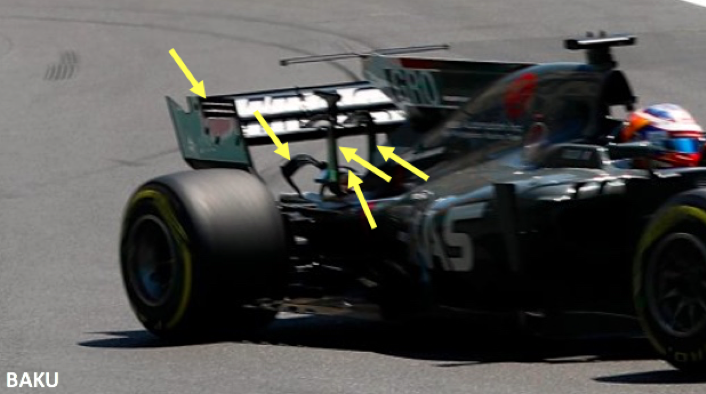 Lastly, the number of endplate louvres has been reduced from four to two, with the pressure differential either side of the endplate being significantly lower than for the wings being used in Canada, and especially Monaco. Sauber continued its strong focus on front and rear wing performance in Baku, which is not particularly surprising given the team is using last year’s Ferrari power unit and wings contribute to a great deal of a racing car’s drag. For Azerbaijan, the team arrived with three new front wings, having used its first low downforce version in Canada. The Swiss team ultimately opted for v1 in competitive sessions, featuring an upturned inboard section of the central flap, together with a cut down and reduced angle of incidence flap configuration. By cutting down and lowering the angle of attack of the flaps, skin friction and vortex drag would have been reduced. 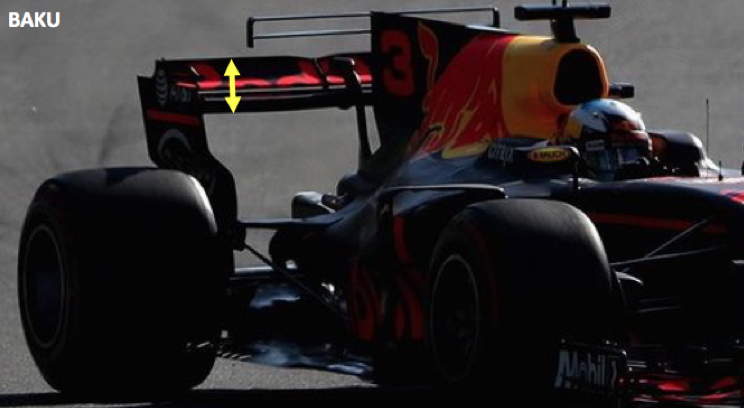 Meanwhile, the upturned flap edge takes a little inspiration from Red Bull, and will change the position of the vortex shed for improved airflow orientation with respect to the bargeboards, critical components in controlling front tyre wake. The v2 wing was a further low downforce configuration, using a different philosophy to reduce drag, by decreasing the flap width for lower skin friction drag and repositioned vortices, but this would not have been as effective as the v2 wing, which spanned a similar area, yet had shorter chord length elements for lower vortex drag, with less of a pressure differential either side of these elements. Firstly, in Canada, the mirror mountings on the MCL32 were revised, with a tall, straight part being shortened and curved. This development is similar to that made by Ferrari for the first race. More work has gone into the placement of the mirrors this year due to the lower rear wing. There are two schools of thought with regards to mirror placement for 2017 – place them high up and in-line with the cockpit sides, confining turbulence to a slither of the car, or place them low and outboard, below the level of the wing’s mainplane. Initially, McLaren had opted for a combination of the two philosophies, but now it has moved to the later in the belief that there will be less of a negative impact on rear wing performance. McLaren arrived in Baku not expecting to score points, and this would indeed have been the case had multiple faster cars not encountered problems. However, one positive was that an upgraded Honda power unit, run by Alonso on Friday, appeared to provide a significant straightline speed boost, although McLaren claimed the performance rise was only 10 bhp. There were some chassis developments for Baku as well: a revised front wing was run in competitive sessions, featuring sharp, flat edges along the flaps’ inboard edges. 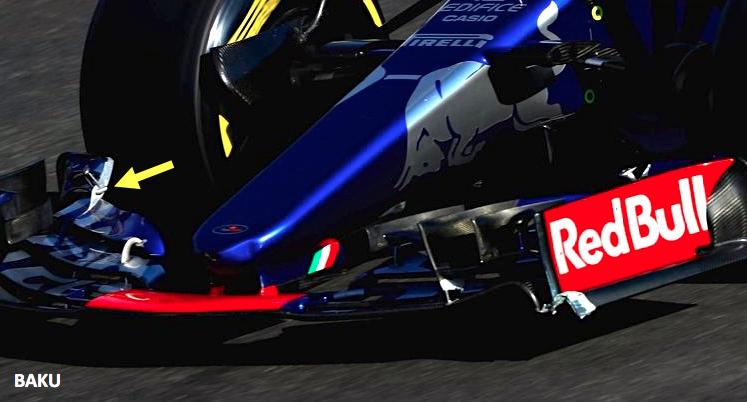 The reduction in drag would be extremely minimal given the similar wing surface area, so this is likely to be a new front wing that will continue to be used at future races. The benefit of the new flap design is the movement of some of the vortices shed by the wing further outboard, which will alter the performance of the bargeboard in directing front tyre wake outboard for improved rearward aero performance.